Let’s talk toilets, specifically Turkish Toilets. Those that know me will be aware that I am no fan of the traditional Turkish Toilet. You know the ones I mean, the shower tray facility with foot rests on either side of the hole together with the obligatory garden hose pipe for flushing purposes. Generally speaking these toilets are usually grim godforsaken hellholes and in most cases, we have to pay to use them. As I usually don’t have any spare change (a bit like the Queen), Ahmed is the one to grudgingly hand it over as he would my pocket money for the week. His generosity is truly legendary. And then to add insult to injury, stands outside with his arms folded like my minder. Having had a knee operation a few years’ ago after a horse riding accident, my breakdancing days are far behind me now and whilst I may or may not make it into the squatting position, sadly I know it’s unlikely I will be able to straighten myself up again without (a) a hoist or (b) assistance. I am sure that Ahmed would have no problem in coming to my rescue; however, I would like to preserve a little of the magic at this early stage in our relationship. As nearly every Turkish petrol station has a pedestal toilet in the gents but only a traditional shower tray thingy in the ladies. Ahmed is usually sent to scout ahead to discover whether there is a suitable toilet and if not he acts as sentry whilst I dash into the gents to use the facilities. I have immense respect for our Turkish sisters who are not only able to manoeuvre themselves into the small cubicles, negotiate the edges of the shower tray without slipping and all in trousers too! On the one occasion I endeavoured to avail myself of these facilities I had a most unfortunate accident when I somehow managed to get both feet in one trouser leg, fell over and bashed my face on the stall door. I spent the remainder of the day with a mild concussion not to mention injuries that looked like I’d been dragged along the tarmac by my face. On the up side, after the initial amusement had worn off, Ahmed did treat me to a Big Mac. Omg the visions I had while reading this post! But I sympathise with you having encountered similar toilets in some Italian villages a few years ago! I’m getting very good at crossing my legs! I remember those from when we lived in France and I never could figure out how to use them. Oh my goodness, that’s terrible and there was me thinking Ireland was backwards because we hardly have any public toilets here. We have “toilets” like that here in Italy and whenever I am out I try to hold it as long as possible, only breaking down and using it when my bladder is 30 seconds from rupturing. This does not help with the “splash-back” problem. I came across only one squat toilet in our brief time in Turkey. It was where the bus stopped so not much choice and I resigned to my fate fairly quickly – at least it was very clean! I have been in Turkey for a month now and still I refuse to use the dreaded stand and squat! me too – I am just not that bendy! I used this type of toilet when I was in China.. ugh is all I have to say. um, what happens if one needs to do more than just “pee”? You are so funny. I wish I could write like you. och, right there, I could not travel to a country with shower tray toilets. What next, lol. Right on your money. Sad but true. I’m out of idioms that attest to the veracity of this post. Ahhh the infamous squatty potty! While living in Korea and traveling Asia I had a whole system to ensure my pants didn’t get any “funk” on them while visiting the squatty. Your pic does seem to have some “rumble strips” haha ;). Hey thx so much for stopping by my blog! It twas a pleasant surprise. I lived in Jordan for four months thankfully never needing to use a squatty toilet, even though though that’s what was predominantly available. I said “Never again!” after one use in China- and that was even in a skirt and not pants! Common in ritual areas. My vote (and choice then) not to pee! What a horrible experience, falling and smashing your face. I am so sorry. I think if you grow up using these toilets, you must develop the right muscles needed and learn the center of gravity/ weight balance to use them effectively, naturally, without thought or effort. A flight attendant friend of mine told me that on India and Turkish routes, the toilets are often broken because the women climb up on the pedestal style toilets and stand on them to go. Thanks for sharing. And thanks for reading my blog. thank you too! I’ve noticed that when the Turkish crouch down they are able to put their heels flat to the floor and we struggle with that! Too funny… and sadly all too familiar. As I count down the days until I leave for my trip, I feel time slipping away where I know I should be practicing my squats at the gym, if only to make the dreaded squat toilet a little easier once I’ve arrived. Squatting will only get you so far though right? Ugggh the memories..
Indonesia had toilets like these. I cannot for the life of me take squatting on that to take a poop. It brings a shiver down my spine. Ha, very funny! Though I’m sorry for your injury – poor thing. Many years ago, I lived in Malaysia for two months with an Indian family, and the only toilet option in the apartment was the squat kind. At first I was horrified, but you do what you gotta do… By the end of my time there, I had become quite blasé about it, and developed much stronger leg muscles! My favourite though, are the Middle Eastern ones that are sit down, but have a little spray hose beside the toilet that you can elect to use if you like. I ALWAYS elected to use it, peeing or otherwise, and especially appreciated it during certain times of the month! Now, I have become too fastidious and miss the squirty hoses when I’m back home. Ah toilets; what a rich topic indeed! Turkish paid toilets are the worst. I am loving the music idea and thanks for visiting me too! Oh, the joys in the necessities in life!!! For public toilets I actually prefer them, it is so much cleaner. Although I can understand that if your knee doesnt cooperate it is a toughie. Here in Mexico they have the regular toilets, but without seats. I don’t really care for those either. I find hanging over a toilet so much harder. But anyway, while traveling through Asia I once entered a ‘normal’ toilet with footprints on the seat. Try to imagine that, haha. LOL You are a lot braver than I – thanks for giving me my first good laugh of the morning! Oh good gracious your post “To Pee or Not to Pee” is wonderful. I was recently using squat toilets in VietNam, which I have not yet posted about in full (I will definitely be linking to your wonderful blog when I do!) and my own arthritic knee created a similar problem. I look forward to each new post, Crazy. Keep driving your train and I’ll keep hitching my freight car. Thanks for liking another of my posts. Loved this Blog post, after travelling in Bali, Thailand and Nepal, I think I have seen ands used a good assortment of these types of toilets, in fact I do have a few Q. for anyone who really knows how to use these contraptions. Q.1 What do you do if you need to do #2’s and where does it go?? I’ve still yet to master these type of squatty potties and not sure if I really want to – maybe someone else can give us some advice? This one looks pretty clean. i had imagined all sorts of unpleasantness. Toiltes in other countries – even, or perhaps especially, advanced technology toilets – can be daunting. Think I must have caught it on a good day! I agree a girl’s gotta do, what a girl’s gotta do! I think I’ve been spoilt living in the UK as you have an expectation that the facilities will at least be clean! Going through your post and some of the comments, my admiration for our ancestors is going up. I have heard people from Italy, Thailand, Bali, France, etc. say that they had (or have) similar toilets in their countries. Well, add india to that list. Amazing how despite limited contact, some things developed in almost identical manner across continents. They say it strengthened certain parts of the anatomy. No C-sections in those days…. Ha ha! Only if you were the heroine of Pearl S Buck’s The Good Earth. I hate these toilets!!! You still come across them in Italy occasionally. me too – I can’t just close my eyes and think of England in these circumstances! My mother can remember her mother, with her long skirt, standing and peeing straight down in the dirt, but I’m afraid those days are long behind us. Who is Ahmet anyway? Thanks for checking out my blog! OMG – I am thankful those days are behind us, I think you can get arrested for that these days! And Ahmet is my reason for relocating to Turkey (bless him)! thank you too for visiting! Crazytrain, this is why I swear by traveling in long skirts only! They never touch the floor if you’re unfortunate enough -as we all are, since we love traveling too much- to have to pee in dirty airplane toilets, at disgusting gas stations or in your shower-stall nemesis: the Turkish (or Indian!) Toilet. Works a charm! will have to bear that in mind or possibly just continue crossing my fingers and my legs! ah, the memories you brought back. It’s 2 months later and I’m still finding toilet paper stashed in all my pockets (unfortunately at this point they are all hard little rock-like thingees, having been washed over and over. I bet you smile when you find one of your rock-like thingees though! Ha ha, this is a funny post. It reminds me of South Korea. Bathroom culture is one of the most interesting aspects of travelling abroad, in my opinion. Thanks for posting. This is better than the ones we saw at the ruins of Ephesus (also a lovely place to visit). Great post!. Thanks, Crazy, for liking my post “water motion and reflections”; appreciate it a lot. Being a little accident prone myself, I was always going to be a skip, jump and a hop away from falling in. My favourite was taking an overnight train to Ankara. It swayed like a carnival ride and it was one of the fabulous Alaturk non-toilets. I must have looked like a hopping toad as I tried to squat just in time for the cabin to almost jump the track. My chiropractor says thank you. LOL – think I’ll give the Turkish trains a miss! HA I recently blogged about the joys of the squatty potty! Good post! Even now I cannot bring myself to use them! They also have these toilets in France. They maybe great if you are wearing hardly any clothes, but not if its minus 3C outside, so you’re wearing 5 layers of clothes, thermal an AND trousers which you are hitching up with one hand, holidng on for grim death with the other while gripping your handbag firmly between your teeth! those toilets look hazardous….and I thought the South Asian ones were bad! I completely agree; I have seen some very grim toilets in Turkey and have had to cross my legs and think of England until I find one more suitable. I think you and your friend were probably far more braver than I! During my European travels, I have been stymied by many a toilet, usually when it comes to how to flush them. If I ever came upon a toilet like you describe here, though, I have no idea what I would do!! Anyway, since my first bathroom conundrum, I have become increasingly interested in foreign bathrooms. Why are these things not covered in travel guides?? 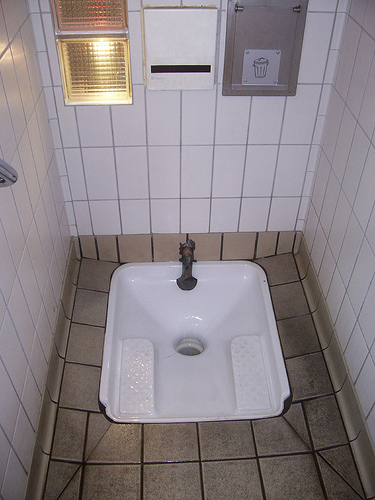 I had a web page 12 years ago where I posted all my foreign toilet pics, and collected pics from others, too. I used to dream of publishing a book about toilets around the world. I think someone has beaten me to it, though! I detest Turkish toilets and think you need to be double jointed to use them and it perplexes me that there is always a pedestal toilet in a stall in the gents. I didn’t realise that there was a book about toilets around the world but it does seem to be a subject which we all seem to have strong feelings about. My parents lived in Turkey (ankara) for a few years. I have experienced these up close and personal. Yuck. I always kept kleenex or TP with me and wet wipes. Most only had a faucet or hose. Now i know why there is an ‘unclean’ hand. If I had to travel I would have to take a toilet with me, hmmmm I could see me trying to explaining that one to my husband. Great site, I’m looking forward to following you and all of your adventures. That is the toilet?? For real?? You are a brave brave woman Dallas…..boldly ‘going’ we many have not ‘gone’ before…. I feel sorry you had to go through that. But I can't help myself from laughing by how you tell the story 😀 thank you for posting this. It is a life saving lesson from emarasment. Now I know I should tote a pee bag when touring other countries. Just noticed some typo’s, don’t know how to edit it. Sorry.